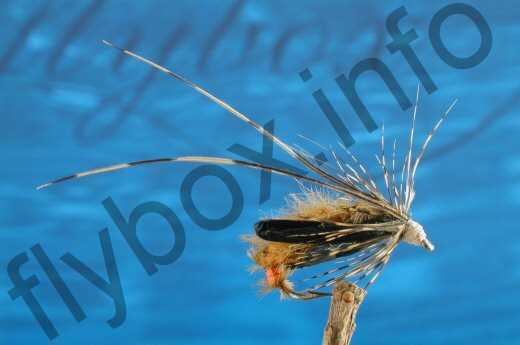 The Elite Sedge Pupa is best used as a point fly under a buoyant dry sedge pattern such as Al Troth’s Elk Hair Sedge. Thread : Beige 8/0 Uni. Under Abdomen : Fluorescent orange floss. Abdomen : Close turns of tan Roots Elite Lace. Rib : Camel ostrich herl. Thorax Cover : Golden pheasant centre tail fibres. Vestigal Wings : Black raffia. Thorax : Dark hare's ear antron. Antenna : Golden pheasant centre tail fibres. Currently there are no comments about the Elite Sedge Pupa fly pattern from other fly fishermen yet.